Forward Tristan Macalolooy races with the puck during an SDSU hockey game in the 2017 season. 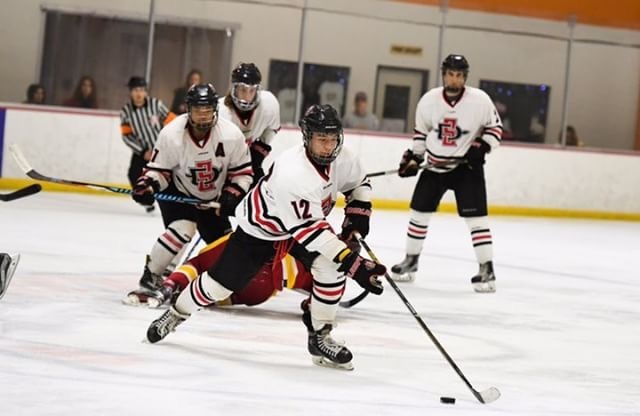 The San Diego State men’s ice hockey team enjoyed a successful weekend on the road, as the Aztecs secured victories over Cal State Fullerton last Friday and Chapman University on Saturday. The Aztecs entered the weekend 13-1-2 and improved their season record to 15 wins in 18 games. 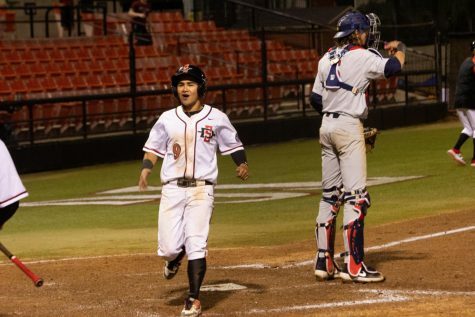 SDSU took out Cal State Fullerton on Friday night, 9-1. 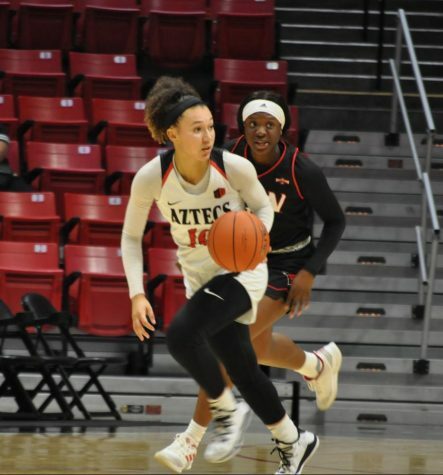 The Aztecs dominated nearly every aspect of the game, outshooting the Titans 35-13. Six-and-a-half minutes into the game, Sophomore forward Isaac Miller and graduate student forward Anthony Mata scored within ten seconds of each other to open the Aztecs’ scoring account. Following a goal scored by graduate student defenseman Tyler Smith late in the first period, Mata tallied a power-play goal to begin the second period. Junior defenseman and captain Joshua Nobida contributed a power-play goal nearly five minutes into the second period. Isaac Miller combined with freshman forward Tristan Macalolooy at the ten-minute mark of the second period, as Macalolooy scored to improve SDSU’s lead to 6-1. The Aztecs’ leading scorer, senior forward Hayden Bolls, scored nearly halfway into the third before senior forward Patrick Miller and sophomore defenseman Adrien Wisch added power-play goals to cap off a 9-1 victory. Junior goaltender Austin Hathcoat recorded 12 saves. 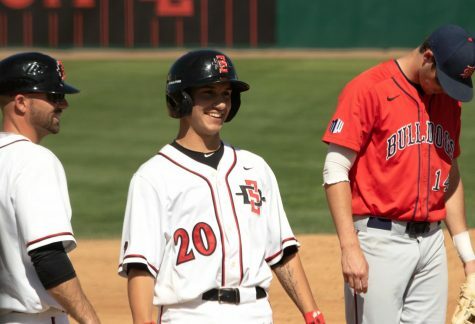 San Diego State took advantage of Cal State Fullerton penalties and finished four of 10 on power plays. 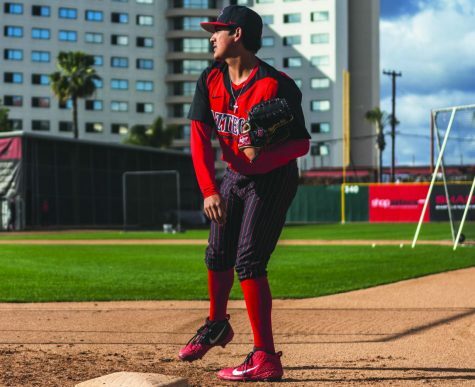 Less than 24 hours later, the Aztecs traveled to Anaheim to face Chapman University. Junior forward Aaron Mayer dangled around the Panther defense to score a sublime opening goal five minutes into the game. Mayer notched a second goal in the second period, while Anthony Mata and Isaac Miller scored two goals each. Senior forward Tommy Lisac, Tyler Smith, and Tristan Macalolooy added a goal each. Freshman forward Jack Dobbins played an impressive third period, scoring three goals within 10 minutes. 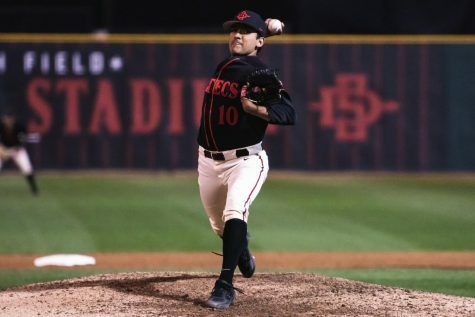 San Diego State finished 0-4 on power plays, but the Aztecs took advantage of Chapman’s mistakes, including delayed line changes and misplaced passes. 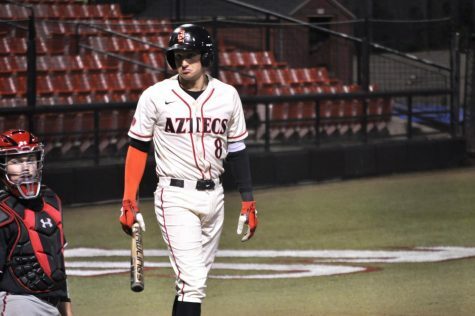 The Aztecs thrashed the Panthers’ slow-paced defense, which led them to a decisive 12-2 win. Freshman forward Reece Breuckman believes that speed and urgency were keys to both victories over the weekend. “We were moving the puck around and getting a lot of opportunities. The goalie we played on Saturday was really good, but puck movement opened it up,” Breuckman said. Jack Dobbins, who scored a hat trick against Chapman on Saturday, says the difference between the Aztecs’ good and bad performances this season is complacency. “Complacency has been our biggest issue. We’ve had a sense of ‘we’re the best.’ We almost play down to the other team’s level, so we just have to get rid of that thought of complacency,” said Dobbins. The Aztecs men’s ice hockey team is currently preparing to take on Cal State Long Beach in the annual outdoor game. 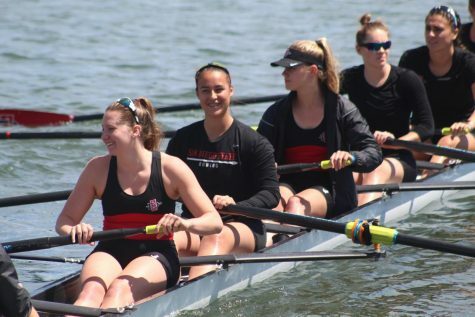 SDSU faced Cal State Long Beach last month on Nov. 18 at Poway Ice Arena. 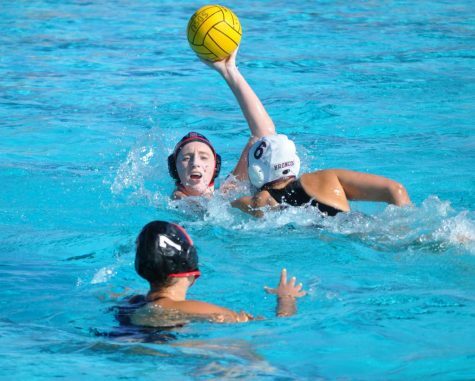 The Aztecs were able to pull off a crucial win, 6-5. “I’m expecting the ice to be a little slushy, but the other team has to deal with it too, so it’s an even playing ground,” Dobbins said. The annual outdoor game will take place on December 18th at 8:15 p.m. at the Del Mar Fairgrounds.